Googleâ€™s algo currently places a lot of weight on core domain authority. Threadwatch has a lot of authority. And the relevancy algorithms may also add weighting on fresh documents (and weighting on old established trusted documents). Once the freshness boost drops off if it does not pick up many more links it will rank lower. Was it intentional ranking for that phrase? I didnâ€™t intend it to, and I am not sure if Natasha did, but itâ€™s ranking will probably fade over time, unless a big issue is made out of it and controversy causes more people to link at it. I will take Aaron’s advice and not provide any further reason to link to it. Of course, another SEO, among those determined that I retain my lingering doubt about SEOs as a group, posted another post on Threadwatch with my name in the title and a link to the original Threadwatch post, which will surely rank for my name on Google. To whoever posted that — this why there are unfair bad stereotypes of SEOs! Fortunately, Aaron and others who showed up below show why such stereotypes are not fair, despite the concerted efforts of other SEOs to propogate them. I was going to title this post, “Why You Don’t Mess With The SEO Industry,” but I thought I would take a more open-handed approach. To all the well-meaning SEOs out there, can you explain how this SEO smack against me in one of your forums got to be the #2 Google result for my name? My gut tells me that this is in fact what happens to you when you mess with the SEO industry — which leaves me feeling a bit like I’m dealing with the mafia. Or maybe an SEO would like to explain how I can make that NOT be the #2 result for my name. Some will surely ask, why is Karp jumping to conclusions again. Didn’t he learn his lesson? A few reasons. First, the Google results for my name have been stable for months, and all of sudden this SEO rag shows up as #2. Hard to believe that’s a coincidence. 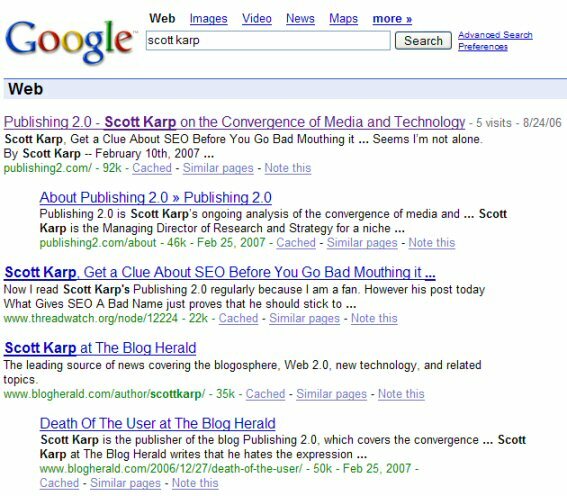 Second, Jason Calacanis, a far, far harsher critic of SEO, has complained of his Google results page being gamed. That’s all circumstantial evidence, of course. But add to it some lingering doubt about SEO, and before I know it I’m jumping to conclusions. 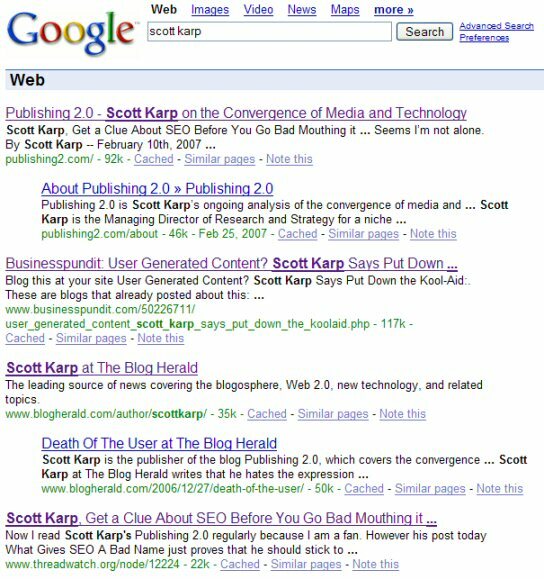 So, again, I plead to any SEO who can hear me, please help wipe away that lingering doubt.